Whether you're preparing genomic samples for next gen sequencing, quantifying DNA samples, or performing a microarray analysis, it is important for life science researchers to be able to detect the biological and chemical changes that occur in samples. The advances in microplate technology industry has evolved to give life science researchers a greater functionality, flexibility, & throughput when evaluating samples for change. Below we examine some of the key instruments in microplate technology and which factors you should consider when making a purchase. The Thermo Scientific Varioskan Flash spectral scanning multimode reader is designed for analysing and optimization of assays such as binding assays, ADMETox, molecular biology assays, enzyme kinetic studies, ion-channel and cell signalling assays. Whether you're discovering new biologics, preparing genomic samples for next gen sequencing, gene expression, or microarray analysis, Agilent has designed the new BenchBot Robot to provide an effective way for you to benefit from the speed and reliability of an automated microplate handling system no matter how your workflows evolve. And finally, no analysis would be possible without a surface to store the samples being examined. Microplates, also known as microtiter plates, usually come in 96, 384 or 1536 well formats with many differences such as colour, shape and size of wells, and others. The type of microplates that you use during an experiment will usually depend on the type of analysis you are performing on the samples. PerkinElmer's AlphaPlates are designed specifically for AlphaLISA and AlphaScreen assay applications. 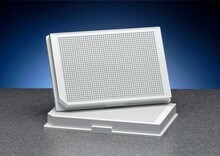 The Alphaplate is a unique light gray engineered microplate for reduction in cross talk and assay optimization.